The 26 metre motor yacht Luck-a-Lee IV, listed for sale with Bob Cury at RJC Yachts, has now had a significant $900,000 price cut. Luck-a-Lee IV was built in GRP by US yard Pacific Mariner to a design by William Garden and delivered in 2007. She is currently offered for sale for the first time having been only lightly used by her original owner. A custom four-stateroom interior for eight guests has a master suite with king size bed amidships with two VIP suites and a twin cabin forward. All cabins on this yacht for sale have en suite bathrooms. She features satin cherry joinery throughout and a comfortable main saloon with a dining area and also has an open galley with upgraded appliances and granite worktops. Additional features include stabilisers, twin generators and a watermaker, plus a Jacuzzi and tender on the flybridge. Twin MTU 12V 2000 engines ensure she cruises comfortably at 20 knots and her 2,400 gallons of fuel provide a good range. 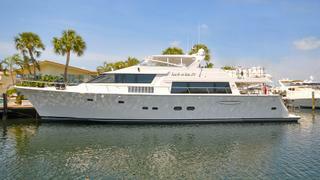 Lying in Lighthouse Point, Florida, Luck-a-Lee IV is now asking $2,895.000.